The uniqueness and strangeness enveloped custom bike look this one. How not, almost its whole body covered with genuine leather decorated with tattoos. 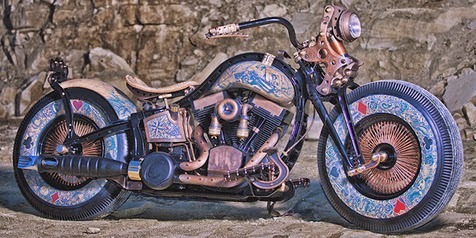 Cheyenne Bike deliberately presents art adorning the body, tattoos, into the art of modifying the two-wheeled vehicles. So do not be surprised, The Recidivist - the name of this custom motorcycle, bike construction covered by genuine leather with color that resembles human skin. Genuine leather? True, Cheyenne deliberately cover every detail motorcycles Harley-Davidson Softail based with genuine leather from animals, yes it is cow skin. Nevertheless, cow skin color is engineered so that as closely as possible to the color of human skin. The skin layer covering some parts of motors, including tires, tank, seat, rear fender and some other small accessories. While some other custom parts left on the 'workshop' named Game Over Cycles (GOC). Behind the custom motorcycle tattooed actually Cheyenne has a mission to present the inspiring story of a man who has a strong character, a man should be able to appreciate the individuality, personal expression and a sense of freedom.